No. 72 on the High Street left is a bit of a puzzle. It's not a nationally listed building although it is listed on a local level. The city council's conservation report of 2002 describes the current facade thus: "Its narrow frontage is surmounted by a gable and the walls are white and rendered, and lined out to replicate stone. The first and second floors have a single sashed window with, at second floor height, an elaborate modillion cornice which lies just below the spring of the gable. The date is probably late 19th century". This dating is almost certainly incorrect and the story of the building is a lot more complex than the simple description suggests. 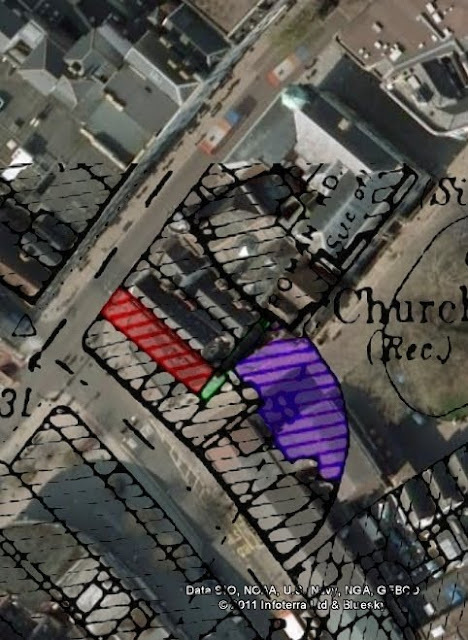 In 1905 a number of properties surrounding St Petrock's church were either rebuilt or heavily modified. These included Nos. 65 & 67, Nos. 70 & 71 (to the immediate left of No. 72), No. 72 itself as well as Nos. 73 & 74 on the corner of the High Street and South Street. But did No. 72 really only date from the late-19th century or even from 1905? The doubts begin with a sketch of c1827 by Arthur Glennie in the Westcountry Studies Library. This sketch shows No. 72 with an almost identical facade to the one it still has today, with the same lining in the render, the same cornice, the same single sash windows and the same small window in the gable. In fact No. 72, High Street dated to c1600 and was a late-Elizabethan house of some prestige. It undoubtedly was affected by the 1905 redevelopment too and proof comes from Harbottle Reed, a local architect and historian, in his 1931 article 'The Demolition of Ancient Buildings of Exeter'. Although thin on facts, Reed included a detailed drawing right of what he called the 'south elevation' of No. 72 prior to its demolition in January 1905. It seems that the south elevation, which was at what Reed believed to be the rear of the house, was affected by the rebuilding of the north elevation on the High Street. But not all of the south facade was rebuilt as a photograph from the late 1950s shows that at least the upper two stories retained sash windows, probably installed in the early 19th century. Perhaps only the ground floor and first floor were affected. Either way, Reed's illustration shows the high status of No. 72 when it was first built c1600. 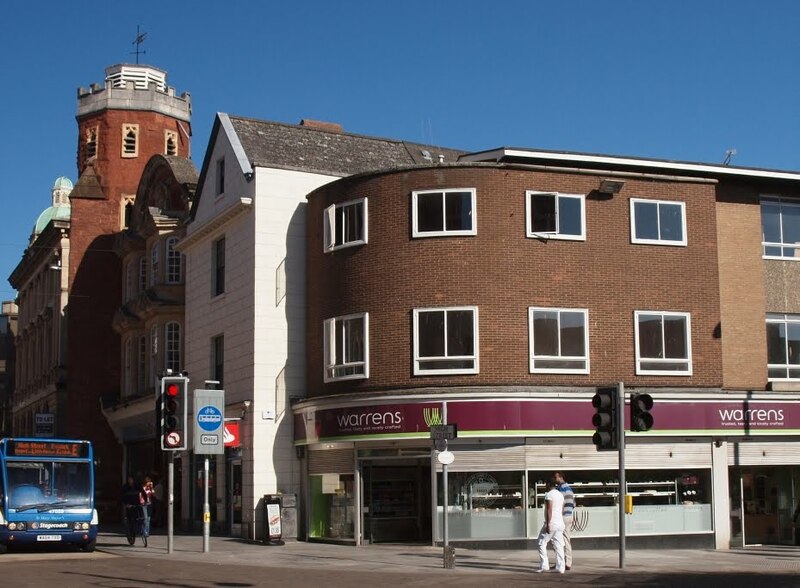 Unusually for Exeter, the ground floor was made of stone, inset into which was a four-light mullioned window. On the first floor was what must've been the property's finest room as it contained a ten-light mullioned and transomed window which ran across the entire width of the house. Everything shown in Reed's illustration was apparently demolished in 1905. The newly-revealed facade was four storeys high with a gabled roof. The first floor jettied out over the ground floor, which was constructed of stone. Inset into the first floor was a six-light window. It was built on exactly the same alignment as No. 72. 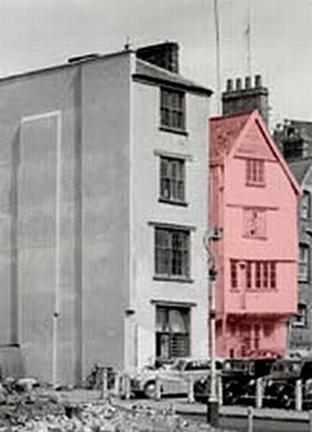 The photograph right © Devon County Council dates to the early 1950s and shows the facade, highlighted in red, which was once hidden behind the Globe inn. To the left is the back of No. 73, High Street, formerly the site of Thomas Elyot's house which was rebuilt in 1845. Another photograph from the 1950s shows that the facade was part of a separate block with a gap between itself and No. 72 on the High Street, and this is probably the clinching evidence. I think this is the story of No. 72, High Street: it was built on a deep but narrow plot of land for a wealthy merchant in the very centre of the city at the end of the 16th century or in the first years of the 17th century. It followed a plan which was once fairly widespread throughout Exeter but which can now be seen in only a handful of examples (e.g. No 18, North Street). 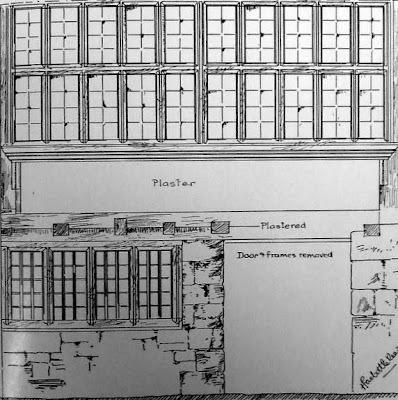 This plan consisted of a front block, containing perhaps a shop on the ground floor with a parlour or hall on the first floor and other chambers above. This front block opened out onto the High Street and still exists in some form as the current building. It was the south elevation of this front block which Harbottle Reed recorded as having been demolished in 1905, its northern facade already having been remodelled prior to 1827. But behind the front block was a back block, separated by a small courtyard and all part of the same building. The front block and the back block were connected by a timber-framed gallery. 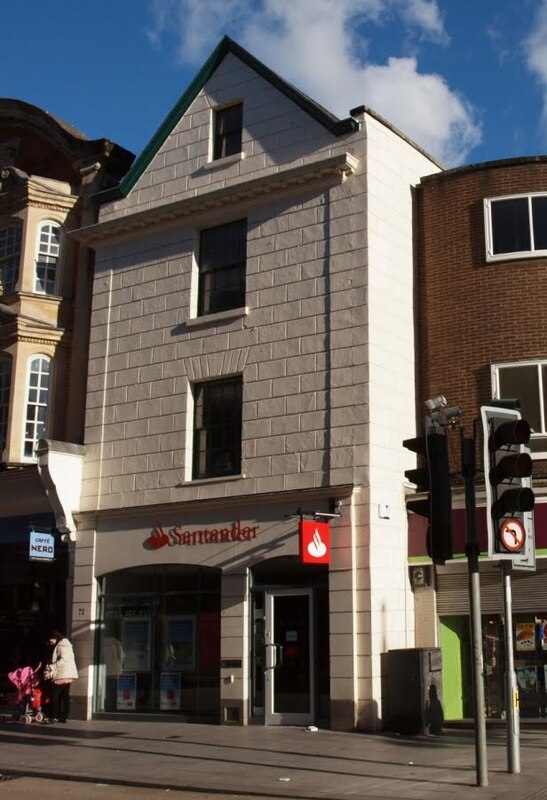 The back block would've contained the kitchen on the ground floor with further accommodation on the floors above and, crucially, it was the south elevation of the back block which was revealed in 1942 following the destruction of the Globe inn. I don't think there is any other realistic way of explaining the evidence. The aerial view left shows the single block which now comprises No. 72. The High Street facade is to the north. What I believe was the early-17th century layout of the property, two blocks of accommodation connected via a gallery, is highlighted in red. This arrangement appears to have survived until the 1960s. The largely false wall which now hides the backs of No. 70 & 71 and No. 72, High Street is highlighted in purple. What happened next defies belief. During the 1950s the newly-revealed half-timbered facade from the early 1600s, which had survived the English Civil War and the Industrial Revolution, and which had so narrowly escaped obliteration in 1942, was itself destroyed by Exeter City Council to create a squalid pedestrianised entrance into the Cathedral Yard from South Street. The facade was ripped down and replaced with a modern red-brick wall as the depth of the back block was reduced to widen the opening into the cathedral precinct. To disguise this new brick wall a second, largely false wall was erected, built from concrete blocks with a hexagonal motif below. No. 73, High Street, which had replaced Thomas Elyot's house in 1845 and which had also survived the war intact, fared even worse and was demolished completely. The post-war entrance into the precinct is described in the city council's conservation report as a "major disappointment". And so it is. It is impossible to understand the mentality behind the decision to destroy the south elevation of No. 72 in the 1950s, especially given the widespread destruction of the city during the air-raid of 04 May 1942. It was nothing more than the blatant vandalising of the city's cultural heritage. The reduced portion of the back block and the remains of the front block on the High Street have since been united under a single pitched roof, removing any external trace of the block and gallery arrangement, and I have no idea if anything of historical or architectural interest remains within what is now a single structure. 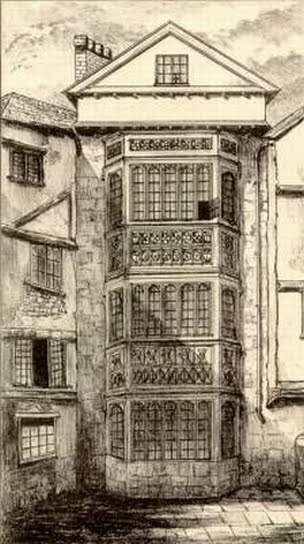 The medieval townhouse of Thomas Elyot must've been one of the finest private houses of its period in Exeter, and although it was demolished in 1845 its most notable feature can still be seen today. The history of the site itself can be traced back in documents to 1284. According to Lega-Weekes, in the late 13th century the location of the Elyot House was a large tenement called Bokerel, one of three such tenements which ran from St Petrock's church to the corner of the High Street with South Street. (Until 1942 this section of land was occupied by Nos. 70 & 71, No. 72 and Nos. 73 & 74 on the High Street.) Prior to its demolition Thomas Elyot's House was at No. 73, High Street. Thomas Elyot was the collector of the customs at the ports of Exeter and Dartmouth during the reign of Henry VII. He was also a notary public and a registrar of the archdeaconry of Exeter in 1495. It is not known if he built the house himself or merely made some additions to a pre-existing property. It's possible that it once belonged to the Dean and Chapter and was purchased by Elyot at the end of the 15th century. The house was built of stone between c1450 and c1500 and sat on a long, narrow plot of land, its main entrance accessed via the High Street with a 'back front' in Cathedral Yard. Inserted into this back front, overlooking the Cathedral itself, was a three-storey bay window which extended across almost the entire width of the building. The drawing from 1839 top shows the window within the context of the Elyot House. The property to the left of the window was No. 1, South Street. The property just visible to the right was the half-timbered back front of No. 72 which survived until it was demolished in the 1950s. Both the scale and the quality of Elyot's window were remarkable. It was built from limestone in the Gothic style. Each floor contained a seven-light window separated by stone panels richly decorated with shields, quatrefoils and other Gothic motifs. Jenkins described the window in his 1806 history of the city: "At a small distance West of the Church [i.e. St Petrock's], is a stone front of very ancient architecture and excellent masonry, beautifully disposed in panels of Gothic fretwork, surmounted with stone battlements". George Oliver called it "the most elegant specimen of the florid style of architecture, for a dwelling house, within the city of Exeter". 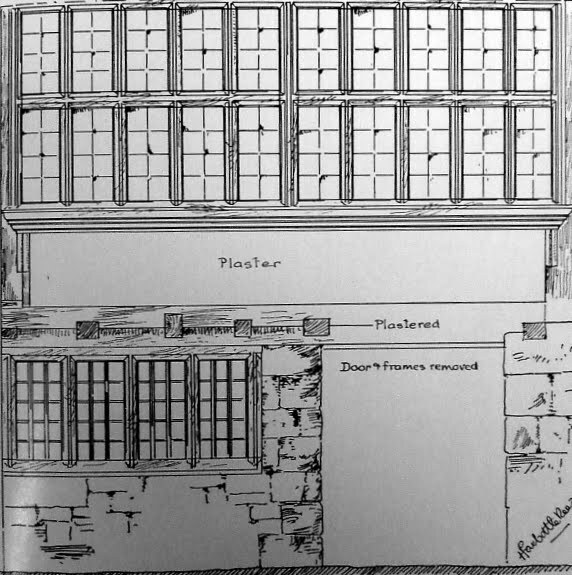 Either the house already existed when the window was inserted into its south wall c1500 or the window and house were both constructed at the same time. 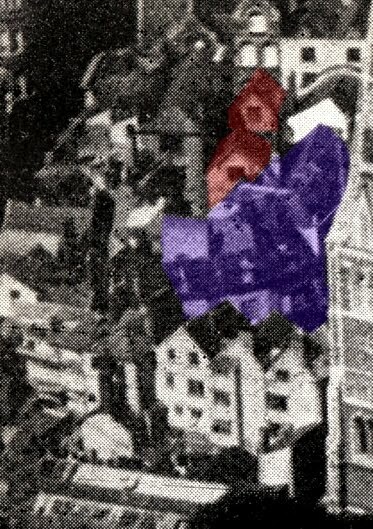 The image right shows a 1905 street plan of the area overlaid onto a modern aerial photograph. The tenement plot of Elyot's House is highlighted in red. 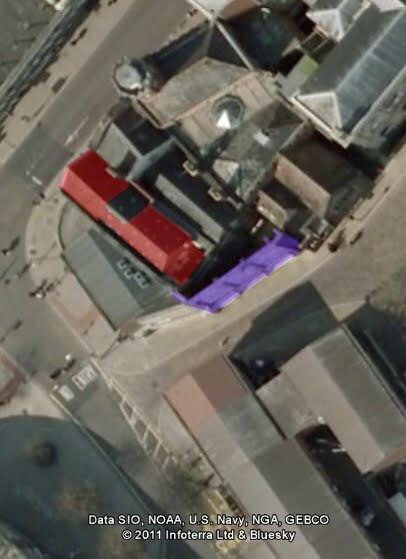 The Globe inn is highlighted in purple. The High Street runs roughly from east to west along the top before reaching the junction with North Street, South Street and Fore Street. A licence dated 20 July 1500 and issued by the Dean and Chapter granted Thomas Elyot the right to place two stone corbels into the wall of his tenement which would project 2ft into the Cathedral Yard (then the cemetery of St Peter's cathedral). According to the licence these corbels were to be used specifically for the upholding and building of a window ("edificandum fenestram"). Lega-Weekes believed that this licence accurately dates the elaborate bay window to 1500 although there is no sign of the corbels in the drawing from 1839. Perhaps the licence referred to a second, oriel-type window. Either way, on 05 August 1504 Thomas Elyot gave the house to the parish of St Petrock in return for obituary services to be performed for his soul in the event of his death. One other interesting feature of the 1839 drawing is that it doesn't show any doors leading into the Elyot House from Cathedral Yard although it must've once been possible to access the property from the rear. Jenkins recorded that "this fine specimen of ancient architecture, is now so obscured by buildings, that it cannot be seen to any advantage, except from the narrow back court of the Globe Tavern; though it is evident, it was originally open to the Churchyard." This is almost certainly true. Between 1573 and 1603 the cemetery which lay behind the Elyot House was converted into gardens and by the end of the 17th century part of these gardens was occupied by the Globe inn. In the 18th century the sprawling old Globe had totally obscured the view out of Elyot's medieval window. A narrow passageway once ran around the north side of the Globe inn from Cathedral Yard into South Street. Although partially blocked, the passageway remained until the destruction of the Globe in 1942. The passage, which Lega-Weekes called "a traditional right of way", might've been the entrance into the back court of the Elyot House which is mentioned in various deeds as the "introitus from South Street". Few other details about the house survive. There are no floor plans or accurate measurements or a description of the interior. Thomas Elyot's house at No. 73, High Street was completely demolished in 1845 but even the Victorians couldn't bring themselves to destroy the Gothic bay window. 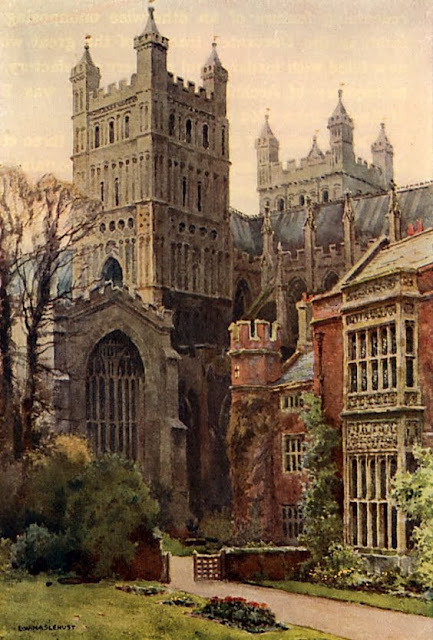 It was purchased by the Bishop of Exeter, Henry Phillpotts, and reinstalled in what was once the medieval great hall of the Bishop's Palace left. Unfortunately it was also greatly modified. Elyot's window was three storeys high, the former great hall at the palace only two. The pieces of the window that survive intact today are the decorated panels which separated each floor, now rearranged to fit a two-storey building. Transoms were added to the window openings and the mullions were extended in height, but even in its mangled condition it evokes something of the prestige of both its original form and its original owner. The property to the west of Elyot's house, No. 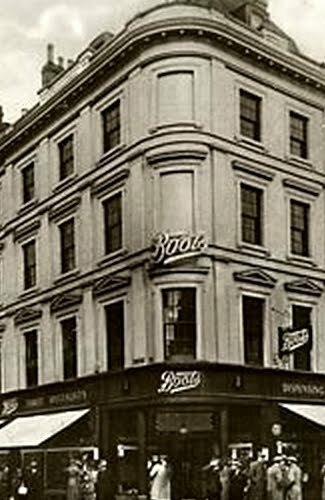 74 High Street, was demolished at the same time and a new building with neo-Classical details took their place as Nos. 73 & 74. The facade of No. 73 was rebuilt when the High Street was widened in 1905. Despite surviving the Blitz of 1942, this mid-19th century building with its facade from 1905 was demolished during post-war redevelopment in the 1950s. What was once the site of the medieval house is now taken up by a poor flat-roofed, brown-brick building from the 1960s. 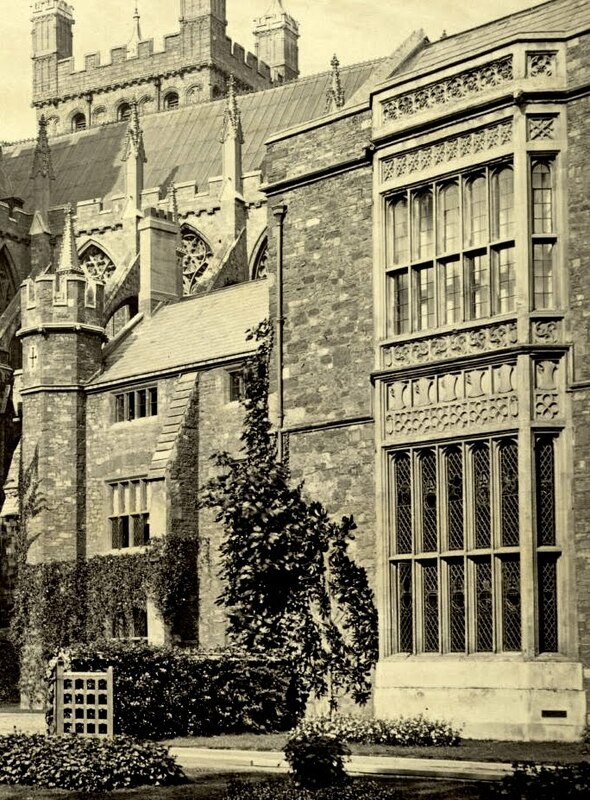 Thomas Elyot's elaborate window, now over five hundred years old, is still situated in the wall of the old great hall at the Bishop's Palace below (Courtesy of Cornell University Library). Nos. 73 & 74 is worth writing about for two reasons. Firstly, it was a handsome building in its own right. It was rarely photographed but is worth remembering here for its aesthetic qualities alone. Secondly, and not unrelated, the building which replaced it after World War Two provides an object lesson in how poor planning and inferior design can impact negatively on an important urban location. The image above is a composite photograph showing a postcard from c1910 merged with a photograph of the same area from September 2010. Nos. 73 & 74 are highlighted in red and shows No. 73 after the alteration to its facade in 1905. The 17th century Chevalier Inn in Fore Street on the far right. The entrance into South Street is between No. 74 and the Eastmans building, the street being much narrower than it is today. The site is one of the most historically significant in the city: the ancient Carfoix. It has been the junction of Exeter's four most important streets i.e. the High Street, North Street, South Street and Fore Street since at least the Middle Ages. This was the location of the huge late-medieval water conduit, known as the Great Conduit, which stood near the centre of the junction until its removal in 1770. Dating to c1845 Nos. 73 & 74 were two properties constructed as one building. It stood on the corner of the High Street with South Street and had elevations on both, its corner built as an elegant curve, similar to the almost contemporary building on the corner of the High Street with Queen Street above right which was demolished in 1971. A sketch in the Westcountry Studies Library dated c1827 shows the two buildings which had previously stood on the site and which were demolished c1845. They were both four-storeys high and timber-framed with steep gabled roofs, not dissimilar to the still-standing No. 72. One of these old properties, No. 73 in fact, was known as Elyot's House. It was named after Thomas Elyot, the customs collector at Exeter and Dartmouth during the reign of Henry VII and who lived in the house during the closing years of the 15th century. The mid-19th century rebuild of Nos. 73 & 74 consisted of four-storeys. The ground floor contained shop fronts and the first floor had rusticated blocks with arched windows. All of the second floor windows had attractive pointed pediments and above the plainer third floor windows was a modillion cornice, the roof hidden from street view. 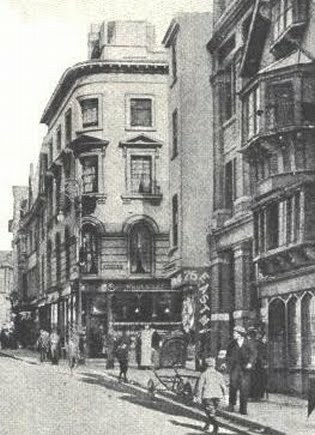 The elevation on the High Street was originally three bays wide, as shown left c1900. 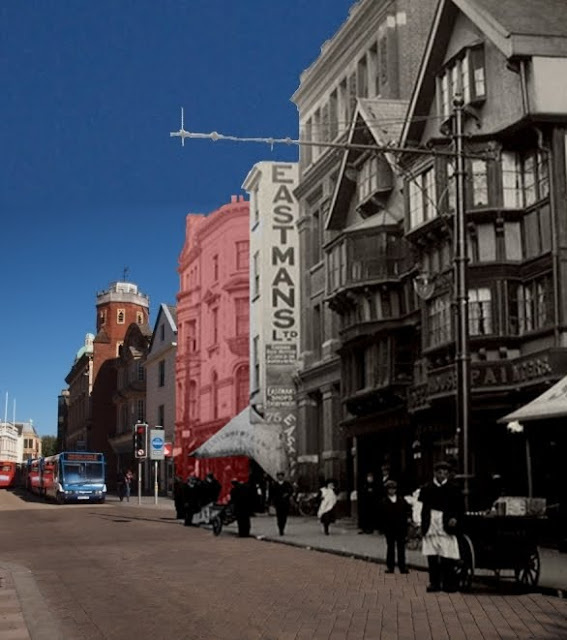 When the road-widening project around St Petrock's church occurred between 1903 and 1905 the High Street facade was reduced from three bays to just one bay and a new street frontage was built on the site of No. 73. (The newly-built facade of No. 73 is visible in the photograph at the top of this post, four-storeys high with a gabled end and with two big stone bay windows on the first and second floors. Although the facade was rebuilt the building work from c1845 remained at the rear, stretching back to the Globe in the Cathedral Yard.) Probably constructed of brick and dressed stone with a stucco exterior, No. 74 was destroyed during the air-raid of 04 May 1942, although No. 73 survived unscathed and continued in use throughout the 1950s as a branch of the Fifty Shilling Tailors (more recently known as the retail chain 'Burtons'). Predictably, the post-war treatment of the site hasn't been successful. Having survived the Blitz, No. 73 was subsequently demolished in the late 1950s as part of the project to widen South Street and to create a new entrance into the Cathedral Yard at the point where the old Globe inn once stood. The building which took the place of both No. 73 and the blitzed No. 74 is remarkable only for its insignificance as architecture. The city council's 2002 conservation report for the centre of Exeter describes the replacement building as "a rather bland, 1950s three-storey building". The report continues: "The siting, scale, fenestration and horizontal emphasis of this corner building, and its poor relationship with No. 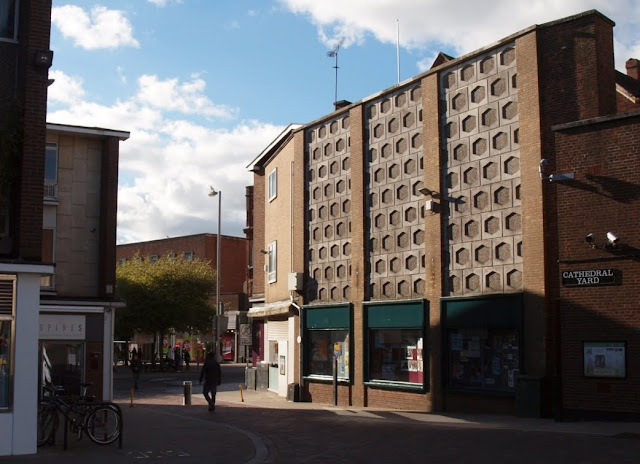 72 High Street is arguably one of the least successful examples of urban design in the city". The replacement structure is shown below, adjacent to the white-fronted gable end of No. 72. It forms a dismal entrance into what was, historically, the most important street in Exeter.